The following rivers and streams or sections thereof are available for public fishing through the courtesy of the landowner, or where indicated by posters, through cooperative agreement, lease, or state ownership. Check the regulation table (Inland District Statewide Species Regulations) for general statewide Species, Legal Methods, and Limits regulations. Look up the waterbody in the alphabetical list of lake and ponds to find any special regulations that apply. If no site-specific regulations are listed for a waterbody, statewide regulations apply. Trout Management Areas (TMA): High quality fisheries offering year-round opportunities. Trout Parks: Easy to fish, frequently stocked areas. Trophy Trout Streams: Stocked with a higher proportion of larger fish. Sea-run Trout Streams: Areas where DEEP is working to establish populations of anadromous brown trout. Class 1: Catch and release only, open year-round, use of barbless single-hook artificial lures and barbless singlehook flies only. Class 2: Two (2) trout per angler per day limit, trout must be 12” or larger to keep from opening day to last day of February. Class 3: Five (5) fish per angler per day limit, trout must be 9” or larger to keep from opening day to last day of February. Designated rivers & streams with no closed season including the entire Connecticut and Thames rivers, and downstream portions of the Coginchaug, Farmington, Housatonic, Mattabesset, Mystic, Naugatuck, Niantic, Quinnipiac, Salmon, and Yantic rivers. Public access to fishing waters is restricted to rights-of-way designated by poster or by permission of landowner. On state-leased streams, fishermen must wade or stay near the stream bank as indicated by signs. X Trout & Salmon Stamp needed to fish in this area. Other fish species are listed for several rivers, see Key to Fish Species Abbreviations in Lakes and Ponds section (Lakes & Ponds). During the hot summer months, heat stressed fish in major rivers, particularly trout, often seek cool water refuge by congregating at the mouths of tributary streams where cooler water is entering. A number of these cool water refuges on the Housatonic River, Naugatuck River, and Salmon River have been identified and under current regulations are closed to all fishing from June 15 through September 15, inclusive. These closures are intended to protect fish from any additional stress during periods of very warm water temperatures. In 2016 due to high water temperatures and low river flows, DEEP issued emergency declarations temporarily closing eight locations on the West Branch and mainstem Farmington Rivers and extending the closure at one location on the Housatonic River. The closed areas are delineated by signs posted by DEEP. Intermittent sections from Route 17 downstream to the Coginchaug River. Intermittent sections from Route 58 along Route 136 to the Saugatuck River. Intermittent sections from the Goshen-Litchfield town line at Brooks Road through Route 63 to the confluence with the Bantam River Inlet near Route 202. Intermittent sections from Route 202 to approximately one half mile upstream of confluence with Bantam Lake. Downstream of Bantam Lake from Bantam to West Morris Road in West Morris. Methods: Fly fishing only where indicated by posters. Intermittent sections from Brewster Pond downstream to Yantic River. From Route 63 crossing in Bethany to confluence with Naugatuck River. Trout & salmon stamp required to fish. Intermittent sections from along Park Road (1/2 mile north of Day Road) to Route 318. Intermittent sections along Route 207 to the Shetucket River. Methods: Barbless single-hook artificial lures and flies only. Trout: Catch and Release Only. Intermittent sections from Four Rod Road to Lower Lane. Intermittent sections along Route 154. Intermittent sections from Mashapaug Lake to Natchaug River. Within the Mohawk Ski Area. From ½ mile west of Route 272 along Route 44 and Lower River Road to confluence with Housatonic River. From Whiting River to confluence with Housatonic River. Intermittent state-owned sections from Gay City State Park to the Salmon River. Trout: 9″ minimum length — Downstream of Route 94, Glastonbury, to the Salmon River. Intermittent sections from Woodward Road to the Quinebaug River. From ¼ mile below Bethmour Road along Route 67 to ¼ mile below Chatfield Street, includes tributary (Hopp Brook) along Miller Road. Intermittent sections from Route 22 to I-95. Intermittent sections along Muddy Brook Road, and from Broad Brook Mill Pond to Scantic River. Intermittent sections from Swantown Road to Old Jewett City Road. Intermittent sections from Town Farm Road downstream to the Scantic River. Intermittent sections from Route 171 downstream to the Still River. Trout: 9″ minimum length downstream of Covey Road. Upstream of Route 202 to confluence with the Bantam River. Intermittent sections from Route 6 downstream to the Natchaug River. Includes East Branch. From Merritt Parkway to Glenville Road (Glen Ridge Road). Intermittent sections along Candlewood Hill Road. Intermittent sections from South Road downstream to Penfield Hill Road. Smith Hill Road to Housatonic River. Nipmuck State Forest from Crooked Road downstream to Roaring Brook. Intermittent sections from Portertown Road to the Moosup River. From Routes 179 and 309, along Route 179 through Canton Center. Trout: 9″ minimum length downstream of Route 179. Intermittent sections from Route 165 to the Quinebaug River. Intermittent sections from Route 17 in Durham through Wadsworth Falls State Park. Downstream from Route 3 bridge to confluence with Mattabesset River. Trout: Daily creel limit—2, 15″ minimum length. Carp: Daily creel limit-1, 26” maximum length. Large & smallmouth bass: 12″ minimum length. Northern pike: 24″ minimum length. Alewives/Blueback Herring: Special closures may be in effect (see Broodstock Atlantic Salmon & River Herring). Note: Several of the boat launches may flood during periods of high water. Intermittent sections from South Main Street to Stevens Street. In Bristol from Artisan Street downstream to confluence with Pequabuck River. Intermittent sections from Gooseneck Hill Road downstream to Aspinook Pond. Intermittent sections along Route 30. Note: Wild Trout Management Area includes a portion of the Pootatuck River upstream and downstream of the confluence as posted by DEEP. Intermittent sections from Hoopole Hill Road downstream to Pratt Read Reservoir. Intermittent sections along Route 19. In Pachaug State Forest, south of Route 138. Trout: 9″ minimum length-Downstream of Route 66 to the Salmon River. Intermittent sections accessible from Routes 45 and 202 to Wells Road. From Lake Waramaug to confluence with Housatonic River. Intermittent sections from Guilford Lakes downstream to Route 1. Intermittent sections from Meckaur Municipal Park through Plumtrees Road to Route 302 (includes unnamed flow-through pond in Meckauer/Bennet Memorial Park). Intermittent sections from Judd Hill, through Larkin Trail State Park and Southford Falls State Park to Route 188, then to Barry Road. Devils Hopyard State Park and intermittent sections below the park to Hamburg Cove. Trout: 9″ Minimum length — From Foxtown Road to the dam at Mt. Archer Road. Intermittent sections along Darling Road and Salem Road. Trout: 9″ Minimum length — Downstream of Witch Meadow Road, Salem to the Eightmile River. Intermittent sections from Route 14A downstream to the Moosup River. In Bartlett Brook Wildlife Management Area. Intermittent sections along Witchhazel Road downstream to Mares Hill Road. Intermittent sections from Northford to I-95. Intermittent sections from Moose Hill Road (Monroe) to Route 110 just above Housatonic River. Intermittent sections from Goodwin Dam to RT 4 (Farmington Center). Then from Tariffville Memorial Park (Simsbury) through the Tariffville Gorge (Bloomfield). Then from mouth of tailrace canal below Rainbow Dam to confluence with Connecticut River. From Goodwin dam (Hartland) downstream tothe intersection of Hogback Road and Route 20 in Hartland, as indicated by signs posted by DEEP. Catch and Release Only from September 1 to 6:00 a.m. 2nd Saturday in April. Daily creel limit—2, 12″ minimum length from 6:00 a.m. 2nd Saturday in April to August 31. Season: Open 6:00 a.m. 2nd Saturday April–last day March. Catch and Release Only from September 1 to 6:00 a.m. last day March. Farmington to Windsor; From Route 177 bridge in Unionville Center downstream to Rainbow Reservoir. Trout: Daily creel limit—5, 9″ Minimum length. Windsor; From mouth of tailrace canal below Rainbow Dam to confluence with Connecticut River. Note: All fishing prohibited in tailrace canal and from mouth of tailrace upstream to Rainbow Dam. No longer stocked by DEEP. Trout: 9″ minimum length downstream of Slocum Road. Intermittent sections from Moose Meadow Road to Mansfield Hollow Reservoir. Intermittent sections from New Road to the Quinebaug River. Intermittent sections along Route 16 downstream to the Salmon River. Intermittent sections from North Grosvenordale Pond to Blain Road. Intermittent sections from Route 220 downstream to the Connecticut River. From the bridge on Route 4 upstream approximately 1½ miles, as posted. Upstream from Housatonic River as posted. Trout: Daily creel limit—2, 12″ minimum length. Intermittent sections from Staffordville Lake along Route 19 and Furnace Brook Road to Glenville Pond. Intermittent sections from Gardner Lake to Fitchville Pond. Intermittent sections from Battle Street downstream to the Scantic River. Intermittent sections along Wig Hill Road. Access in Pachaug State Forest. Intermittent sections from Green Falls Dam to Rhode Island. Intermittent sections from Gulf Road Marsh downstream to the Scantic River. Intermittent sections along Route 184. Along Route 272 from Hall Meadow Cemetery to the Hall Meadow Brook Reservoir Dam (John Minetto State Park). Intermittent sections from Route 80 to Route 1. Daily creel limit—2, 9″ minimum length from 6:00 a.m. 2nd Saturday in April to August 31. Season: Open from 6:00 a.m. 2nd Saturday in April-last day February. Trout: Daily creel limit—2, 9″ Minimum length. Intermittent sections from Rockville to the Connecticut River. From Route 64 to Hop Brook Flood Control Impoundment. Intermittent sections along Route 6 to the Willimantic River. Intermittent sections from Pickett Road downstream to Packerville Road. For Housatonic River Flows at Falls Village: 1-888-417-4837. Thermal refuges: Areas within one hundred feet of signs indicating such closure posted by DEEP at or near the mouths of Kent Falls Brook and Macedonia Brook are closed to all fishing from June 15 to September 15. Season: Open year-round except in areas within 100 feet of signs indicating such closure posted by DEEP at or near the mouths of tributaries that are closed to all fishing from June 15 to September 15. Methods: Fly fishing only in the 3 mile section upstream from Route 4 bridge, as posted. Area managed for smallmouth, statewide regulations apply. Season: Open year-round except in areas within 100 feet of tributaries that are closed to all fishing from June 15 to September 15, as posted. Large & Smallmouth bass: Catch and Release Only. Derby, Orange, Shelton, Milford, Stratford Downstream from dam on Lake Housatonic (Derby). Walk-in access at Derby Dam off Route 34 (Derby) and Canal Street (Shelton). From Howell’s Pond in Tunxis State Forest to Mill Street, approximately 1½ miles above West Branch Reservoir. Intermittent sections from Miller’s Pond to Smith Cove. Intermittent sections from Stevens Road downstream to Upper Millpond. Intermittent sections from Route 2 to Poquetanuck Cove. Includes Shewville Brook, Gates and Hallville Ponds, and Poquetanuck Brook. Intermittent Sections from Route 66 to the Blackledge River. Trout: 9″ minimum length — Downstream of Grayville Road to the Salmon River. Intermittent sections from Church Hill Road downstream to Poquetanuck Cove. Intermittent sections along entire length. Trout: 9″ minimum length downstream of Old Colchester Road to Jeremy River. Through Kettletown State Park to Lake Zoar. Intermittent sections from Route 14 to the Quinebaug River. At Town Hill Road, then along Route 45 from Curtiss Road downstream to North Shore Road. Intermittent sections from Dow Road downstream to Mill Brook. Intermittent sections along Route 161 from Silver Falls to Niantic River. From Anderson Road (Laurel Brook Road) through Wadsworth Falls State Park. Intermittent sections from Route 4 in Harwinton through Roraback Wildlife Management Area to confluence with Naugatuck River (Thomaston Flood Control Area). Intermittent sections from Route 97 to Paper Mill Pond. Intermittent sections from Roseland Lake downstream to the Quinebaug River. Intermittent sections along Route 67 from 1 mile above Hogback Road to Hoadley’s Pond (Seymour). Intermittent sections from Long Meadow Pond through Guntown Road, along Rubber Avenue to ½ mile above the Naugatuck River. Within Bristol Park, along Route 64 through Steinmann Park to Route 188. From Rugg Brook Road through Mad River Flood Control Impoundment to Route 263 crossing. Trout: 9″ minimum length downstream of Grantville Road. From Shearshop Road downstream through Milton to the East Branch of the Shepaug River. Intermittent sections from East Putnam Road downstream to the Five Mile River. Intermittent sections from Taft Pond through Mashamoquet State Park to Quinebaug River. Intermittent sections in Berlin from Brook Street to Lower Lane. Downstream from Route 372 bridge to confluence with Connecticut River. Trout: 9″ minimum length downstream of Route 16. Intermittent sections from Reservoir Road to Pleasant Valley Road. Within Talbot Wildlife Management Area (WMA), and also extending upstream of the WMA as posted. Note: Wild Trout Management Area includes Beaver Brook within the Talbot WMA. Intermittent sections accessible ¼ mile upstream of June Road to Palmer’s Hill Road (just above Mianus Pond). 6:00 a.m. 2nd Saturday in April. Intermittent sections from Edson Brook to Willimantic River. From the Housatonic River upstream along Route 128 for approximately 1 mile. Intermittent sections from confluence with Canoe Brook, as posted by DEEP, to Mohegan Lake, then from base of Samp Mortar Reservoir dam to Sturges Road in Fairfield. From Merritt Parkway bridge downstream to Mohegan Park Pond. Intermittent sections from River Road through Sleeping Giant State Park to Skiff Street. Boats and canoes prohibited, including Axle Shop, Clarks, and Woodruffs Ponds. Along Gadpouch Road in Meshomasic State Forest. Intermittent sections from the Rhode Island line to the Quinebaug River. Methods: Fly fishing only in lower half of section, as posted. Intermittent sections accessible from Route 44 (downstream of Route 44 in American Legion State Forest) to the West Branch-Farmington River. Intermittent sections from Route 39 to Cedar Hill Road, New Milford. Intermittent sections from Route 44 to Mansfield Hollow Reservoir. Intermittent sections from Hell Hollow Road to the Pachaug River. Intermittent sections from Northford Road below McKenzie Reservoir (Wallingford), along Tyler Mill Road, Route 150, to Spring Street, North Haven. Within Pachaug State Forest to Glasgo Pond. Downstream of confluence of Haleys Brook and Whitford Brook. Intermittent sections along Route 198 to Shetucket River. From the confluence of the East and West Branches in Torrington to the Thomaston Flood Control Dam. Intermittent sections from Thomaston to Waterbury. Platts Mill Road and Route 8 overpass area in Waterbury, through the Naugatuck State Forest to the Route 42 bridge (Pines Bridge Road) in Beacon Falls. Thermal refuges: Areas within 100 feet of signs indicating such closure posted by DEEP at or near the mouths of tributaries are closed to all fishing from June 15 to September 15. Methods (all species): From September 1 through March 31, single fly or lure with a single free-swinging hook only. Additional weight may not be added to the line. Anglers are reminded that the season is closed from March 1 to 6:00 a.m. on the 2nd Saturday in April for all species except broodstock Atlantic salmon (see Trout Management Area below for year-round catch-and-release fishing for trout). Methods (all species): From September 1 through March 31, single fly or lure with a single free-swinging hook only. Additional weight may not be added to the line. From Kinneytown Dam (Seymour) to confluence with Housatonic River (Derby). Intermittent sections from Stillwater Pond to Route 4. Intermittent sections from Bradley Corners Road downstream to I-95. Intermittent sections from Niles Road to the Route 202 bridge immediately upstream from Nepaug Reservoir. Downstream of confluence with Latimer Brook. Intermittent sections from Old Town Farm Road to Route 47. From Northfield Cutlery Pond to Northfield Flood Control Dam. Intermittent sections from Haviland Road (Ridgefield) to Riverside Avenue (Norwalk). Intermittent sections from Oxoboxo Lake downstream to Route 32. Intermittent sections from Beach Pond to the Quinebaug River. The demarcation line between the Pachaug River and Beachdale Pond is the west side of the bridge on Route 49. Intermittent sections along Route 148. Intermittent sections along Route 49 downstream to the Green Falls River. Through Rockwell Municipal Park in Bristol downstream to Route 177 in Plainville. Trout: 9″ Minimum length downstream of Canal Street in Plymouth. From King Street (Routes 229 and 72) in Bristol to Route 177 in Plainville. Includes the section of Coppermine Brook from the confluence with the Pequabuck River to Artisan Street. Intermittent sections from West Pequonnock Reservoir (Monroe) along Route 25, then through Old Mine Municipal Park, Pequonnock Valley Wildlife Area, Twin Brooks Municipal Park, Unity Municipal Park, and Beardsley State Park in Bridgeport. Other: A parking permit (fee for non-residents) must be obtained from the Town of Trumbull to park in one of the town’s parks. 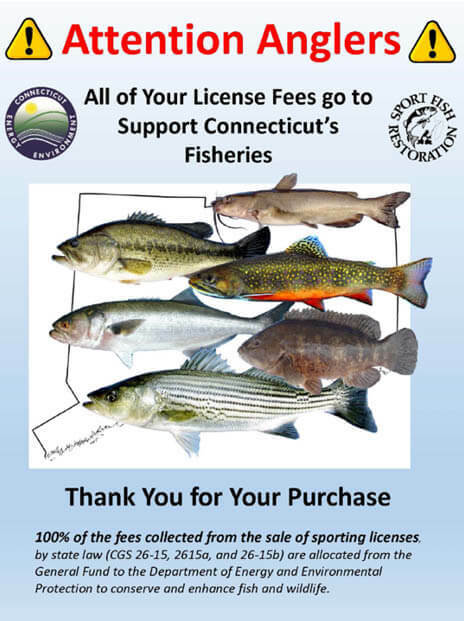 A free “Fishing Parking Permit” is available to individuals with a valid fishing license and can be obtained through the Trumbull Parks and Recreation Department. Trout: 9″ Minimum length downstream of Sexton Road. Intermittent sections from Ellington Road to Route 5. Intermittent sections from the junction of the Nonewaug and Weekeepeemee Rivers near Route 47 in Woodbury to ¼ mile below Route 172 in Southbury. Intermittent sections from Routes 6 and 25 to Hanover Road just above Lake Lillinonah. Intermittent sections from Route 9 downstream to Higganum Reservoir. Intermittent sections from Route 25 to Turkey Hill Road, and from Sandy Hook through Rocky Glenn State Park to Walnut Tree Hill Road, just above Lake Zoar. Approximately 1 mile (as posted) of Pootatuck River, ½ mile upstream and ½ mile downstream of confluence with Deep Brook. Intermittent sections from Hallville Pond to Poquetanuck Cove. Intermittent sections from Rhode Island to Moosup River. Intermittent sections from the Massachusetts line to the Shetucket River. From ¼ mile below Cheshire Road, Cheshire to Route 150, Wallingford. Entire river in Southington, and in Cheshire upstream from Cheshire Street. North Haven-New Haven; Downstream from Route 5 bridge in North Haven to junction with New Haven Harbor. From Route 114 (Woodbridge) to Lambert Road (Orange). Intermittent sections from Route 207 to Jeremy River. Trout: 9″ Minimum length downstream of Old Colchester Road. Intermittent sections from Portland Reservoir to Connecticut River. Intermittent sections from ¼ mile upstream of Route 137 to Cold Spring Road near downtown Stamford. Intermittent sections from Route 94 to Connecticut River. Intermittent sections along Ruth Hill Road. Intermittent sections through Nipmuck State Forest to the Willimantic River. Trout: 9″ Minimum length downstream of Tartia Road. Intermittent sections from headwaters to Keeney Cove. From East Street below the gorge in North Granby, along Route 189, crossing Routes 202 and 20, and through Granbrook Town Park to the Farmington River. Trout: 9″ minimum length-entire river from Massachusetts border downstream to the Farmington River. From Route 20 (Granby) to confluence with Farmington River (East Granby). From the Granby-Hartland line, along Route 20 through Simsbury Road. Then Salmon Brook Municipal Park and Route 10, below McCleans Game Refuge. Trout: 9″ minimum length downstream of Route 179 (Hartland) to confluence with East Branch. Intermittent sections from the junction of the Blackledge and Jeremy Rivers to the Leesville Dam. Trout: 9″ Minimum length-entire river downstream to the Route 151 Bridge. Methods: Fly fishing only in midsection of area, as posted. Catch and Release Only from September 1 to 6:00 a.m. on the 2nd Saturday in April. Downstream of Route 151 Bridge to junction with Connecticut River. Thermal refuge: Area within 100 feet of signs indicating such closure posted by DEEP at or near the spring along at Sunrise Resort State Park is closed to all fishing from June 15 to September 15. Intermittent sections beginning ¼ mile from the Massachusetts line, along Route 183, through Algonquin State Forest to the confluence with the Still River above Riverton. Trout: 9″ minimum length- entire stream downstream from Massachusetts state line. Intermittent sections from Route 7 in Danbury through West Redding along Route 53 to the Mark Twain Library Dam (1 mile above Saugatuck Reservoir). Then intermittent sections from 100 feet below the Saugatuck Reservoir Dam tailrace (as posted) through Lyons Plain to Dorr’s Mill Dam and ending at the Merritt Parkway. Daily creel limit—2, 9″ minimum length from 6:00 a.m. on 2nd Saturday in April to August 31. Intermittent sections from intersection of Routes 53 and 57 (north of Weston Center) to the Saugatuck River. From the intersection of Routes 39 and 37 in Sherman Center to Candlewood Lake. Intermittent sections from Massachusetts state line to Connecticut River. Intermittent sections from headwaters to Whitfords Brook. Intermittent sections along Route 67 from Hodge Park downstream to the Route 67 bridge. Intermittent sections from Willimantic to Greenville Dam. Thermal refuges: Open year-round except in areas within 100 feet of signs indicating such closure posted by DEEP at or near the mouths of tributaries that are closed to all fishing from June 15 to September 15. Methods (all species): From September 1 through March 31, single fly or lure with a single free-swinging hook only. Additional weight may not be added to the line. Anglers are reminded that the season is closed from March 1 to 6:00 a.m. on the 2nd Saturday in April for all species except broodstock Atlantic salmon. Intermittent sections from Indiantown Brook to Hallville Pond. Intermittent sections from Hewitts Fly Pond to the Pawcatuck River. From Route 106 in New Canaan to the Merritt Parkway. Intermittent sections from Route 74 to Hop River. Intermittent sections from its source to the Moosup River. Intermittent sections from Painter Hill Road, Route 47 to Paper Mill Road. Intermittent sections in Winsted and from Sandy Brook to Farmington River. Trout: 9″ Minimum length downstream of confluence with the Mad River. Intermittent sections from Route 171 to the Natchaug River. From Eagle Street downstream through the town linear park. Intermittent sections from Woolson Street, Watertown downstream to Huntington Avenue (Oakville section). Intermittent sections from South Grand Street to Guild Pond, includes the lower 1/2 mile of Muddy Brook. Stratton Brook State Park through Massacoe State Forest. Within Sugar Brook Wildlife Management Area. Intermittent sections from Millbrook Road downstream to Route 155. Intermittent sections from Route 207 to the Yantic River. Intermittent sections from Valley Falls Road to Hockanum River. Intermittent sections from County Road downstream to Mill Brook. From Route 70 (Cheshire) to Route 322 in Milldale. Intermittent sections from Route 87 to the Willimantic River. Downstream from Greenville Dam, includes coves. Intermittent sections from Route 97 downstream to Mashomoquet Brook. Intermittent sections from Route 132, Peter Road to the confluence with the Nonewaug River. Intermittent sections from Route 34, along Grassy Hill Road to ½ mile above I-95. Intermittent sections from Quonnipaug Lake to Route 1. Intermittent sections from East Killingly downstream to the Fivemile River. Intermittent sections from Long Pond to the Mystic River. Intermittent sections from the Massachusetts state line to confluence with Blackberry River. Intermittent sections from Stafford Springs to confluence with Natchaug River. Along the bike path beginning at Lock 12 at Route 42 downstream to Mount Sanford Road. Intermittent sections from Porter Pond to Hazard Pond. Intermittent sections from Wyassup Lake downstream to Spalding Pond. Intermittent sections from Camp Moween Road to Thames River. Methods: Fly fishing only in sections at the upper and lower boundaries of TMA, as posted. Daily creel limit—2, 9″ minimum length from 6:00 a.m. on the 2nd Saturday in April–August 31. Downstream from just below the falls at Indian leap in Norwich. How’s my waterway (accessible at www.epa.gov/mywaterway) helps users quickly find information on the condition of their local waters using a smart phone, tablet, or desktop computer. This tool provides results within seconds using EPA’s water quality assessment data. Check out the condition of your local waterbody today!